Higher performance turbines, lower manufacturing costs and lower prices for consumers drove new U.S. wind energy construction to record heights in early 2014 -- despite the U.S. Congress still debating whether or not to renew the federal renewable energy production tax credit (PTC), which expired Dec. 31. In many parts of the U.S., wind energy is now the cheapest form of electricity generation – cheaper than natural gas and even coal, NextEra chief financial office Moray P. Dewhurst recently stated on an earnings call. The federal wind energy PTC has been instrumental in the U.S. wind energy industry achieving that milestone. Yet, Congress has been playing “now-you-see-it-now-you-don't” with the U.S. wind energy industry for two decades now. Every time the PTC expires, wind energy investment and new capacity tumbles; when it's in place, wind energy booms. It's just bad policy, emblematic of the divisive partisanship, cronyism, lack of foresight and political leadership that has come to characterize U.S. politics. In its “Outlook for Renewable Energy 2014,” the American Council on Renewable Energy (ACORE), working in conjunction with U.S. renewable energy industry trade associations, presents facts and figures that clearly illustrate the triple-bottom-line benefits and advantages the U.S. wind energy industry brings to American society, and how the renewable energy PTC has played a seminal role in spurring them on to realization. Wind energy: Cheapest energy source in the U.S. Faced with the increasingly urgent need to wean ourselves off fossil fuels and build a new clean energy infrastructure for the 21st century and beyond, members of Congress continue to oppose clean, renewable energy policies that carry tremendous, clearly demonstrated economic, social and environmental benefits and advantages. They also continue to support subsidies and incentives for one of the most profitable, dangerously polluting and politically powerful lobbies in U.S. history – the oil and gas industry. The first section of ACORE's “Outlook for Renewable Energy 2014” on the U.S. wind energy sector very clearly and concisely makes the case as to why the wind energy industry more than merits the support of the federal, as well as state and local, governments. Now the cheapest means of generating electricity in many parts of the country, net power generation from wind energy was up 19 percent year-over-year in 2014, meeting 4.13 percent of U.S. grid demand, according to ACORE and the American Wind Energy Association (AWEA). Among U.S. states, 27.38 percent of Iowa, 25.95 percent of South Dakota and 19.39 percent of Kansas's electricity came from wind energy in 2013. A record of more than 10,900 megawatts (MW) of new wind power capacity began construction, and more than 12,000 MW were under construction in last year's fourth quarter -- just ahead of expiration of the wind energy PTC. Upon completion, these 90-plus projects will generate enough clean, renewable electricity to supply another 3.5 million households, according to ACORE. Last year also marked important developments in the nascent U.S. offshore wind energy industry. As ACORE highlights, in addition to the University of Maine's DeepCwind Consortium launching a pilot project, the U.S. Department of the Interior (DOI) held auctions for ocean areas off Rhode Island, Massachusetts and Virginia. Maryland passed legislation to support 200 MW of offshore wind power, while the U.S. Department of Energy (DOE) continued its groundbreaking work on seven offshore wind power demonstration projects. 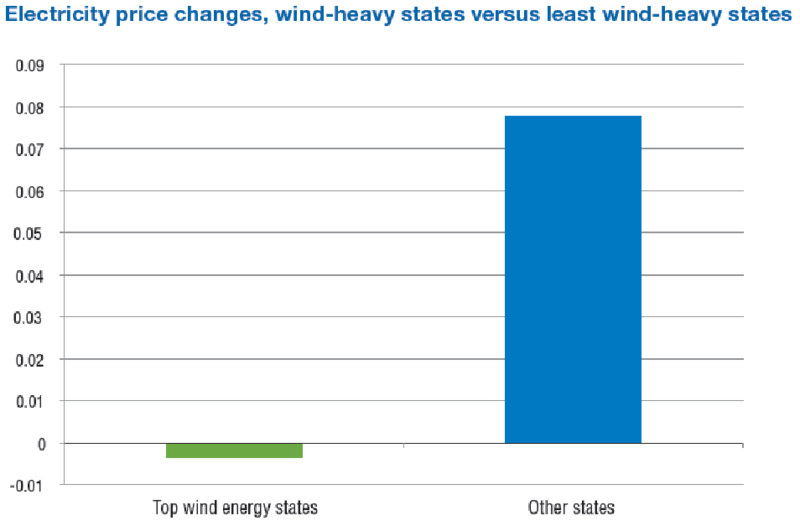 Overall wind energy costs have fallen 43 percent in four years. Driven by advances in technology and stable, supportive policy, wind has been set on a pace to supply 20 percent of U.S. power grid needs by 2030, ACORE continues in its latest annual outlook for the U.S. renewable energy industry. That $25 billion single-year total is long-term private sector capital expenditure that likely would not have occurred had the PTC not been in place. And, as Morgan Stanley's Holzschuh highlighted, that's generating well-paying green jobs -- lots of them. More than 70 percent of the value of wind turbines in the U.S. now carry the “Made-in-the-USA” label, ACORE notes. According to market rules, grid operators add electricity to the grid in response to demand based only on the fuel costs and variable operations and maintenance costs of generation sources. Hence, wind and other zero-fuel-cost generating sources, such as solar, always rank first and displace more expensive power sources. As a result, wind, solar and other such zero-cost-fuels are yielding very real social and environmental benefits in that they push the least efficient fossil-fuel power plants out of the market. That's not only reducing the cost of electricity, it's reducing air, land and water pollution, as well as carbon and greenhouse gas emissions. That mitigates the the threats of climate change, and the already rising costs of extreme weather events. There's more. Enhancing water conservation and water efficiency has become a critical need in the U.S. Extracting and refining coal, oil and natural gas, as well as using it to generate electricity, all require water -- and lots of it. The more we use to produce electricity and fuels for transportation, the less we have for drinking and food production. Using wind and solar energy to generate electricity significantly reduces water consumption and use. Wind power alone saved 36.5 billion gallons of water in 2013, according to ACORE's report. Dubbing wind energy a “drought-resistant cash crop,” farmers and ranchers are receiving consistent income from wind turbines installed on their land. Now when you stack up and add, or multiply, all the advantages and benefits wind, solar and renewable energy afford society as compared to the predominant source of energy of the past 100-plus years – coal, oil and natural gas – it's a wonder how the elected “representatives of the people” could get away with continuing to support and subsidize fossil fuels while opposing and seeking to eliminate the comparatively little that's been done to support, subsidize and otherwise provide incentives for renewable sources of energy. This begs the question of whom, exactly, our elected “representatives” are actually serving. And that's a question for another article, a series of articles, or indeed, an entire book.